It has been said that the destiny of a person is written in their DNA...and this couldn't be more true for me. My father has been a tour guide for the last 45 years in Naples, Amalfi Coast,Sorrento and Pompei Areas. He made the story of almost like the places that he shows to thousands of people everyday. My brother starts this activity 10 years ago as well, growing through beautiful sites and developing skills in tourism field. Here I'm... in my DNA i was already your personal driver across the wonders of south italy. Your Licensed English speaking driver will pick you up at your Hotel / accommodation by a Mercedes air conditioned vehicle and will be happy to give you all the information about the culture,traditions and history of Amalfi coast.On the way he will stop to give you time to take pictures at the best view points. During the day he will recommend you the best restaurants of the Amalfi coast for the lunch and he will give you tips for your shopping. Rome, ancient capital of the greatest empire of the world and now capital of Italy, is one of the main tourist destinations for its great number of cultural and historical sites. The Eternal City is attractive in all seasons and temperatures are unlikely to be rigid, but probably the best time is spring when the weather is mild, neither too hot nor too cold and the long days allow you to enjoy the best tours and walks. Pompeii is in Campania, Italy, not far from Naples.Its major attraction is the ruined ancient Roman city of the same name, which was engulfed by Mt. Vesuvius in AD 79. This is a UNESCO World Heritage Site.Romans took control of Pompeii around 200 BC. On August 24, 79 AD, Vesuvius erupted, burying the nearby town of Pompeii in ash and soot, killing 20,000 people, and preserving the city in its state from that fateful day. 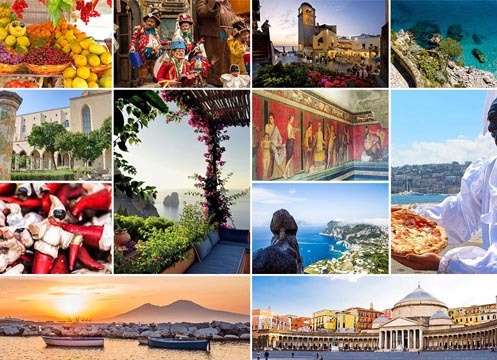 Your Licensed English speaking driver will pick you up at your Hotel / accommodation by a Mercedes air conditioned vehicle and will be happy to give you all the information about the culture,traditions and history of the bay of Naples. This is a UNESCO World Heritage Site. Pompeii is in Campania, Italy, not far from Naples.Its one of the major attraction in Italy which was engulfed by Mt. Vesuvius in AD 79. Your Licensed English speaking driver will pick you up at your Hotel / accommodation by a Mercedes air conditioned vehicle and will be happy to give you all the information about the culture,traditions and history of the bay of Salerno and the Paestum area. Since 1988, UNESCO has recognized Paestum as a World Heritage Site. Paestum contains some of the most well-preserved ancient Greek temples in the world. Legend has it that Hercules, who returned from killing the monster Geryon (the tenth of his twelve labors), had stopped in Rome, where he asked the goddess Fauna of drink, but he refused, since his holy water was reserved for women only. In anger, Hercules built a temple in honor of himself, and forbade women to attend their ceremonies. Meanwhile, a son of Vulcan, the Caco Daemon, stole a part of the herd of cattle that Hercules himself had taken the monster Geryon, and were destined to the town of Argos. Your Licensed English speaking driver will pick you up at your Hotel / accommodation by a Mercedes air conditioned vehicle and will be happy to give you all the information about the culture,traditions and history of the Amalfi coast and the bay of Naples. Sorrento is an elegant town and comune in to the bay of Naples with some 16,500 in habitants. It is a popular tourist destination very famous for the production of limoncello. Florence is the capital of the region of Tuscany in Italy, with a population of about 366,500. The city is considered a cultural, artistic and architectural gem. Florence was the birthplace of the Italian Renaissance. Politically, economically, and culturally it was the most important city in Europe for around 250 years; from some time before 1300 until the early 1500s. Florentines reinvented money in the form of the gold florin. This day excursion is designed for those who wish to enjoy some of the specialties of Campania Region like Extra-virgin Olive oil, Gelato, Limoncello, Wine and learn to make the very famous PIZZA MARGHERITA. After you are greeted at your hotel (either in Naples, Sorrento or Amalfi coast), you will make your way to the archaeological site of Pompeii, the ancient city whose ruins were preserved by the volcanic eruption for almost 2000 years ago here you will spend a couple of hours. This day excursion is designed for the whole family, that wishes to enjoy the highlights of SORRENTO, POSITANO and learn how to make the very famous MARGHERITA PIZZA. A full day private boat tour to Capri from Amalfi Coast and Sorrento Coast. including the Island of Capri, is the best way to experience this world-famous coastline. Arrange a personalized boat tour along the Amalfi Coast and create unforgettable memories of Italy. © Amalfi Driver Service 2019. Tutti i diritti riservati.